The Pedestrian–Cyclist Armistice: For New York’s Citi Bike program, a 10-point resolution. 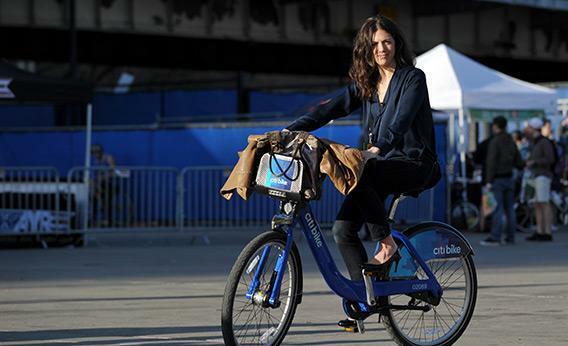 Christine Ribbecke tries out a Citi Bike model bicycle at Bike Expo, an exposition for cyclists, May 3, 2013, in New York. New Yorkers prepare for the launch of the Citi Bike bike-sharing program, which will involve thousands of bicycles at hundreds of locations around the city tol be available to rent. Following in the footsteps of Amsterdam; Portland, Ore.; and Washington, D.C., among other cities, New York is set to launch its bike-share program, Citi Bike, on Memorial Day. New Yorkers have met the impending influx of bikes with both excitement and dread. The mixed reactions are unsurprising: Antagonism has long simmered between pedestrians and cyclists in New York. As bicycle commuting has increased, so have eruptions of hostility between the two factions: These days, no intersection is immune to shouted insults and raised middle fingers. Then there are the daily incursions onto enemy turf: Loiterers defiantly lolling in bike lanes; bike-mounted scoundrels barreling down sidewalks. With 5,500 new bicycles about to hit the streets of New York, the situation is liable to escalate to all-out warfare. Which is why we at Slate decided to convene a summit between a representative cyclist and a representative pedestrian to see if we could defuse tensions a bit. One of us, Aisha, is a daily subway rider and pedestrian. The other, Laura, bikes most places she goes in Brooklyn and Lower Manhattan, including to and from work. We agreed going into negotiations that cyclists and pedestrians should be natural allies in a city of rogue cabbies and oblivious Mack truck drivers. We figured we could probably agree on five rules for pedestrians and five rules for cyclists that would make both sides less likely to resent the other. Compromises were hard won. At one point, Aisha banged a sensible walking shoe against her desk to protest one of Laura’s proposals; Laura responded by drowning out Aisha’s next suggestion with a loud ding-ding-ding of the bell on her handlebars. Actually, that’s completely untrue: We proposed our rules to each other via email, and, there being no serious objections on either side, we ironed out the details of the armistice with a short G-chat session. Though we had different pet peeves, it turns out we both had more or less the same idea of what’s reasonable (in theory). Most of our rules boil down to this: Pay attention, yield when appropriate, and don’t be a jerk. If the 10 resolutions below sound reasonable to you, we hope you’ll share our (Facebook-friendly!) armistice agreement and join our nascent peace movement. 1. Don’t stand in the bike lane when you’re waiting to cross the street. This is huge. New Yorkers hate standing on the sidewalk; it sometimes feels like everyone is playing a version of hot lava in which the street is the only refuge. But as you position yourself to get a head start before the light changes, take care not to plant yourself in the middle of a bike lane (or, if there’s no bike lane, on the edge of the lane where cyclists often ride). This goes double if you wear music-blaring headphones that make it impossible for cyclists to alert you to their approach. 2. Look before you open your cab door, and get out of the way quickly after exiting your cab. Would you open a cab door into a traffic lane without checking first to see if a car was coming? Then don’t open a cab door into a bike lane without checking first to see if a bike is coming. Would you take your sweet time lingering in the middle of a heavily trafficked street after exiting a cab? Then get out of the way as soon as possible after stepping into a bike lane. 3. Don’t walk or run in the bike lane. If you absolutely must walk or run in the bike lane because, oh, a flash mob has broken into dance and taken over the entire sidewalk, be sure to walk against traffic so you can get out of the way when a cyclist approaches. 4. Jaywalk with caution. Jaywalking is a long, proud New York tradition, one that we would never dream of asking anyone to give up. On the whole, New York pedestrians are very good at looking into traffic, gauging how fast those distant cars are going, and timing their illicit walking to avoid getting hit by a car. Now you need to do the same to avoid getting hit by bicycles. Every time you think of crossing even though the orange hand is illuminated—or when you think of crossing outside the bounds of a crosswalk—make a point of looking for approaching cyclists. If your visibility is limited, don’t cross. 3. Don’t ride on the sidewalk. Just don’t. There are already hordes of slow-moving tourists and distracted walkers bumping into one another while playing with their phones. No need to add to the chaos by forcing people to dodge bikes as well. 4. Run red lights with caution. Just as New York pedestrians love to jaywalk, so do some New York cyclists hurry through red lights when there aren’t any cars coming. That’s fine—so long as you do so carefully. If you’re going to “jayride,” slow down and check for people in the crosswalk first, so as not to hit any pedestrians who may not anticipate you coming while cars are stopped at a light. This is especially important if you’re riding on the dotted line in between cars in the car lane—pedestrians hate being the subject of sneak attacks from in between cars. And while you’re waiting to slip past the red light, don’t just park your bike right in the middle of the crosswalk—pedestrians should not have to walk all the way around you when they have the right of way. 5. Don’t bring your bike on the subway during rush hour. Bikes are the biggest waste of train space during a packed commute—and unlike strollers, there’s no good reason for them to be on a subway. There are few things more frustrating than being forced to rub up against a stranger just because a bike is taking up room meant for five additional bodies—except for finding oneself unable to exit the train because a bike is blocking the doors. Agreeing on these terms in principle was relatively easy. Now comes the true test: Putting the rules into action. We both felt pretty good about the results of our summit—but will we actually remember, and honor, our pledges on our next commute?